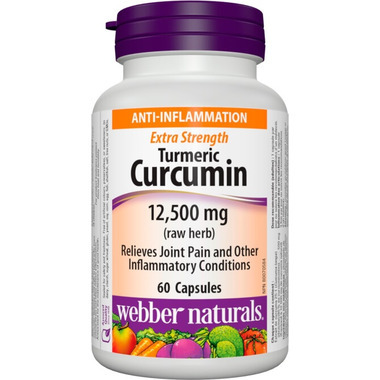 Extra Strength Turmeric Curcumin from Webber Naturals contains 500 mg of turmeric extract in every capsule, standardized to 95% curcuminoids, one of turmeric’s active constituents. Turmeric is used in herbal medicine to help relieve joint inflammation and to provide antioxidant protection for the maintenance of good health. Recommended Dosage: Adults take 1 capsule daily or as directed by a physician. Caution: Consult a physician prior to use if you have gallstones, a bile duct obstruction, stomach ulcers or excess stomach acid, if you are taking antiplatelet medication or blood thinners, or if you are pregnant. Consult a physician if symptoms persist or worsen. Keep out of reach of children. Sealed for safety and freshness. Free of artificial colours, preservatives, or sweeteners; no dairy, starch, sugar, wheat, gluten, yeast, soy, corn, egg, fish, shellfish, salt, tree nuts, or GMOs. Canadian brand. Love this supplement, my knees pain caused by arthritis is getting better and less stiffness.